I live in WordPress. Every morning, I log into the backend of HostingAdvice.com, and a huge chunk of my 9-to-5 hours are spent fiddling with posts, pages, and various custom fields. In my off-hours, I find myself fielding questions from friends and family members, who know what I do for a living and just want to know why their site “suddenly” looks like XYZ. I’d say 90% of the time I end up in their WordPress backend, tinkering with yet another set of plugins and dashboard settings. I don’t mind it, though. WordPress is my home. WordPress.com is a fully hosted website that allows you to build and customize your own website for free. It’s all browser-based, so there are no downloads involved. You just sign up for an account, choose a theme, and then point and click or drag and drop to start creating online. WordPress.org is the site where you’ll find the WordPress software, which is free to download. In this case, WordPress refers to the popular blogging app you can download and install while hosting with a WP-friendly provider. This is often called self-hosted WordPress. Now I’ll go more in depth. Let’s compare how the two stack up when it comes to costs, design, site traffic and storage allowances, and support. Then, we’ll cover steps to migrating your site or blog from WordPress.com to WordPress.org (the self-hosted route). The main difference is that one (WordPress.com) refers to an online website builder that allows you to create, launch, and host a website, whereas the other (WordPress.org) refers to self-hosted software to be used in conjunction with a web host. They’re both free, and they’re both easy to use. Let’s break it down. Domains: WordPress.com offers a free subdomain, meaning your site could be myelephantblog.wordpress.com, but this isn’t conducive to online stores or professional websites. You can pay to register for your own personalized domain, which will cost you an average of $8 to $15 per year. Alternatively, with the self-hosted option, you can sign up for a WordPress hosting plan that includes a complimentary domain name registration. eCommerce: If you’re setting up an online store, you need additional functionality to display products, collect payments, handle shipping, and maybe even offer discounts or return-customer logins. 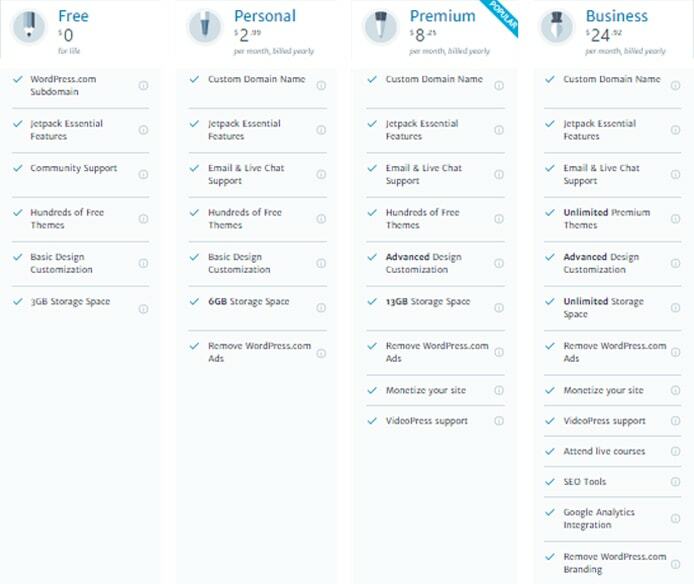 All of this can be done with either WordPress option, but you’ll have to pay for third-party eCommerce tools with WordPress.com as opposed to utilizing the free eCommerce apps available to WordPress.org users. Storage: The average webpage weighs upward of 2,260KB, or 2.26GB. WordPress.com caps your allotted free storage at 3GB. Sure, you can pay for more — $36, $99, or $300 a year for 6GB, 13GB, or unlimited storage, respectively. FYI: Most shared hosting plans promise unlimited hosting for around the price of WordPress.com’s 6GB plan. Ads: Here’s the kicker. WordPress.com reserves the right to display ads on all free accounts. To avoid this, simply sign up for a paid account (or go for the always-ad-free self-hosted WordPress.org option). I’m always initially wary of anything with a $0 price tag. Where’s the gotcha? In the case of WordPress.org versus WordPress.com, it boils down to how much of an investment you’re willing to make in the maturation of your website. WordPress.com is a great starting ground, but WordPress.org is for serious site owners. Here, you’d assume the two WordPress venues are interchangeable. It’s the same design software at its core, right? The gimmick is WordPress.com offers limited theme support, meaning you’re limited to the themes on WordPress.com. Not all of them are free, and none of them allow custom CSS. Alternatively, WordPress.org boasts the designs of millions of theme developers, and you have tons of plugins and add-ons at your disposal. Oh, and self-hosted WordPress lets you edit the HTML and CSS to your heart’s content. I guess that’s the real differentiator. WordPress.com doesn’t support third-party plugins either. This could be seen as good or bad. When used conscientiously, plugins are amazing! They can dramatically extend the functionality of your site (or, consequently, ruin you — conscientiously is the key word there). They are subject to human error, being created by humans and maintained by humans and all. Nevertheless, this is a bummer for WordPress.com users. When it comes to hosting specs, the differences lie in who’s doing the hosting and who’s paying for it. In the case of WordPress.com, WordPress is taking care of the hosting, and the ads are paying for it. If you upgrade to the Personal, Premium, or Business plans, you’re no longer faced with ads, but you’re essentially paying for the web hosting at that point. WordPress.com plans range from $3 to $24 per month, billed annually, with 6GB to unlimited storage allowances. As the name implies, if you choose self-hosted WordPress, you’re paying for web hosting from a third-party vendor. Shared hosting typically costs $3 to $5 per month, and with that comes unlimited storage, site traffic, and databases; a free domain name and email hosting; and a free website builder with hundreds, if not thousands, of professionally designed templates. The WordPress.com hosting itself is excellent, but the additional resources you need to keep a site afloat make the fully hosted site builder inefficient from a cost perspective. By themselves, WordPress.com and WordPress.org are on pretty level ground when it comes to security. WordPress.com’s security help is essentially password strength advice and the option to enable two-factor authentication. Similarly, the main security concerns associated with WordPress software stem from weak passwords, unstable plugins, and missed updates to the core. When the support question comes up, that’s when WordPress.org takes the lead again. At last count, the WordPress community has nearly 250,000 active members who attend meetups around the world. More than 2 million topics are covered in the support forums. Odds are any WP-related issue you run into has been faced and conquered by dozens or hundreds or thousands of folks who came before you. Furthermore, you can check out the “online manual for WordPress and a living repository for WordPress information and documentation” by visiting the Codex. Basically, WordPress support is abundant, and that’s before even mentioning the support of your WordPress hosting provider. Some teams are better at providing CMS-specific support than others, but SiteGround, Bluehost, and DreamHost have been officially endorsed by WordPress. Based on our discussion above, you’re probably thinking self-hosted WordPress is your better bet. If you’ve already invested effort (or even money) into building a site on WordPress.com, however, not to worry. Making the migration to another hosting provider using the WordPress platform is plenty doable — easy, even. Choose the free option: “Create an XML file containing your posts and comments for you to save or import into another WordPress blog.” Select “all content” to export everything, and the XML file will download to your computer. And with that, you’re ready to migrate to bigger and better WordPress things! If you don’t already have a domain apart from yoursite.wordpress.com, you’ll need to register for one. Fortunately, most shared hosts include a domain name in their packages. This domain is yours for a year, or longer with certain providers, and typically only costs around $10 to renew. When it comes to selecting a host, there are several WordPress-specific features we look for, the most important being one-click installations for the WordPress software. Some hosts even preinstall WordPress at checkout. Other perks you may find include WordPress-optimized page caching features for added performance, auto-updates to the WP core, and the option to host multiple sites on a single account. Given the popularity of WordPress for both beginners and experienced developers, several hosts offer shared hosting plans tailored to maximizing performance and usability of the content management system. Bluehost even comes recommended by the WordPress Core team, while InMotion and A2 Hosting soup up their hosting hardware with the inclusion of high-powered solid-state drives. Doteasy, meanwhile, gives users ample configuration options to choose from while ensuring top-notch security with automatically installed WordPress updates and domain privacy. Log into your web hosting control panel (e.g., cPanel or Plesk). Find and click the WordPress logo. Follow the instructions to download and install. If you’re a do-it-yourself-er, the Codex will walk you through how to install WordPress manually. Now it’s time to import all that content we exported from your WordPress.com site that’s now sitting in an XML file on your computer. Go to your newly installed WordPress backend, likely found at yourdomain.com/wp-admin/ or yourdomain.com/wp-login/, and log in to begin. 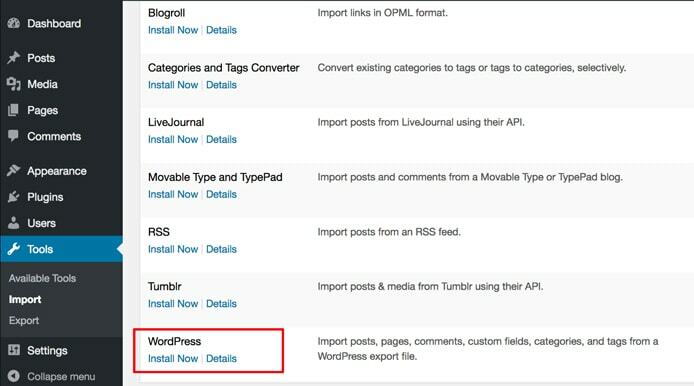 To import content, go to “Tools,” click “Import,” and choose the WordPress Install Now option. This final step is completely optional. If your WordPress.com site didn’t ever really develop a user following, you can set it to private mode and be done with it. In Settings, under the General tab, scroll down to the Privacy section. Select “Private” to keep your site visible to you and approved visitors only, and save the settings. Alternatively, if you do have some readers or site visitors who would miss you if your site suddenly fell off the map, you should redirect them to your new WordPress site. The best way to do this is using what’s called a 301 redirect, which tells visitors and search engines that the URL they’re attempting to visit has moved permanently. This is something you cannot do in WordPress.com without purchasing the Site Redirect upgrade, which costs $13 per year. Keeping this upgrade active for a year or two should be plenty of time for your regular visitors to adjust to the new domain. 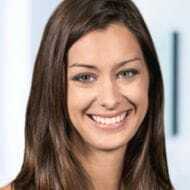 Once you’re ready to cancel the redirect, simply delete the upgrade from your purchases in your WordPress.com dashboard, and then follow the instructions to privatize your WP.com site. WordPress is my home, and it could be yours, too! The question: What are your long-term goals for a web presence? If you just want to dabble in web content, maybe publish a few snarky blog posts and play around with a cool interface, go the WordPress.com route. It’s a great way to get your feet wet with site building, and it’s free and easy to get started. If you intend to build a dynamic, hopefully trafficked website for your business or personal brand, you might as well start with a WordPress host. That’s not to say you can’t make that call down the line, as we now all know how to move from the .com to .org versions of WordPress, right?! Phew, that was a lot of WordPress word vomit. Did I miss something? Let me know!